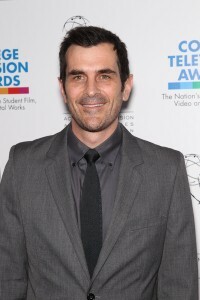 Being a new parent can be stressful, but actor Ty Burrell says that becoming a first-time dad has been inspiring to him and his wife. “There’s lots of problem solving in any marriage, but when you have this collective goal that is a human being, it’s an inspiring rally point,” People magazine reports Burrell telling Redbook. Burrell and his wife, Holly, adopted daughter, Frances, who’s now 6-months old, earlier this year. He says that, even though he’s more neurotic than the character he plays on TV, he’s trying to figure out what works and what doesn’t when it comes to being a parent. “People discuss parenting the way they talk about denominations of faith. They say, ‘The other camp is absurd, and why would you ever do fill-in-the-blank with your kid?’ Then you go to the other camp and they’re making fun of the other people. We try to stay out of the fray,” he said. Still, the 42-year old actor admits that he’s constantly learning, when it comes to being a dad. Burrell plays the neurotic Phil Dunphy on ABC’s Modern Family. The program airs on Wednesday nights.